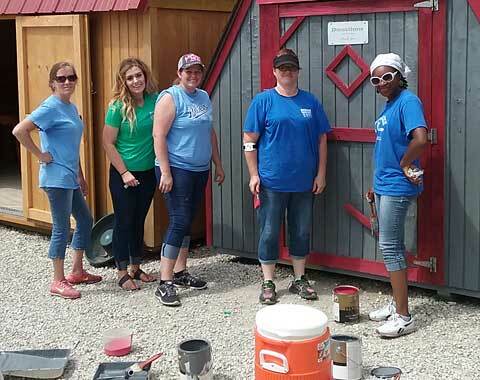 Last month, Help House was a recipient of ECKAN’s “Giving Back Day” on May 24, a group of ECKAN employees, all from the Paola Head Start program, painted two of our outdoor storage sheds. A big thank you to Jamie B., Trish T., Kesha T., Caitlin M., and Kirby M. The sheds look great and your help and service to others was greatly appreciated. Help House will be 15 years old in July. A huge celebration is being planned for everyone in Osage County to come and enjoy a day of listening to local music groups, games for kids young and old, food, and lots more. More information will be available soon, so save the date, July 15, a Sunday evening from 3-8 p.m. It is going to be a great time. You won’t want to miss it. The next “Good Sense” budget class is scheduled for 9 a.m.-4 p.m. Monday, June 25, 2018. It will be a one-day class. You must call to register and stop by and pick up pre-course work. Participants are to bring a sack lunch and beverage. The class is free and once complete the participant is eligible to receive assistance with heating or cooling bills. Mobile Food Pantry dates: Carbondale was 12-1 p.m. on the first Tuesday, June 5, at Carbondale Church of Christian Fellowship; Osage City is 10-11 a.m. the third Thursday, June 21, at Osage City Community Center; Melvern is 12:30 -1:30 p.m. on the third Thursday, June 21, at Melvern Community Center; Burlingame is 10-11 a.m. on the third Thursday, June 21, at Burlingame Federated Church; Lyndon is 12-1 p.m. on the third Friday, June 15, at Jones Park on East Sixth Street. Participants in line 15 to 20 minutes before starting time will be in the counted numbers when it is decided how much of each item each family will receive. A reminder, Help House is open 4-7 p.m. every Monday evening for all services. Tuesday through Friday the hours are from 10 a.m. to 1 p.m. The Summer Fan Club is in full swing. If you have a new or slightly used fan that you could share with someone who is in need of one, please bring it in to Help House as soon as possible. Do not leave outside in the shed, but bring into the center during our regular hours. If you are in need of a fan, stop in and sign up. It will be a first come first served basis. Please do not drop off donated items and leave them outside. Help House has a shed that is available. If items are left outside they can be ruined by animals getting into them or if it were to rain they would get wet and have to be thrown away, and we do not want to have to do that. Harvesters will be conducting training for a few of our volunteers that are interested in learning how to provide help for anyone wanting to apply for SNAP benefits. While we continue to work with Harvesters in many areas, one of the most important is in promoting the My Plate Program that encourages people to eat healthy by choosing the right amount of fruits, vegetables, proteins, grains and dairy products. In the near future Help House will also be establishing a Healthy Living Team. They will work to have one team member in the kitchen at all times, to answer nutritional questions, and provide healthy recipes using the foods available from the pantry. Watch for more news on this in the coming months. Preparations are underway for our annual silent auction fundraisers again this year. Help House will be at Melvern Sunflower Days on June 23 and the Overbrook Osage County Fair on Aug. 11. To make a donation to this effort, call Help House at 785-828-4888. If you have an item that you need picked up, call for more information. The Help House computer lab is designed to assist adults that do not have access to a computer or may be lacking the skills necessary to search for or apply for jobs online. Provided along the way will be helpful hints in communicating electronically with prospective employers, and writing and composition errors to avoid when applying for jobs. Also, assistance is offered with developing a well-written resume that will catch the eye of prospective employers. Help House also provides help in applying for assistance programs that must be completed online, or for those who just want to come to learn truly basic computer skills, this is for anyone who wants to learn at their pace and on their terms. The instructor will work with you to help you with whatever skills you would like to learn, helping you add to your personal enjoyment. Call Paul Schmidt at 602-238-4793 or 785-793-2149 for more information or to schedule an appointment for assistance. For more information about Help House’s services, call 785-828-4888, email [email protected]mail.com, stop by 131 W. 15th St., Lyndon, Kan., or like Osage County Help House on Facebook.